Navigate: StoreFront / Books / All Books / Our Presidents Rock! John Quincy Adams owned a pet alligator? Ulysses S. Grant received a ticket for riding his horse too fast down the streets of Washington, D.C.? Gerald R. Ford briefly worked as a fashion model? You are invited on a totally unique journey through presidential history with Juliette Turner, the National Youth Director of Constituting America. 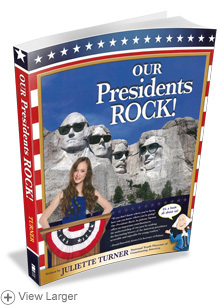 Through fun cartoons, quotes, great graphics, and Juliette’s quirky sense of humor, you’ll discover tons of fun new facts about the presidents of the United States. From S Wheeler of Darien Center, New York on 2/22/2017 . From Kathy Romer of Memphis, Tennessee on 7/6/2016 . From Donald Garrow of Locke, New York on 2/23/2016 . From Rachael Koeber of Fair Oaks, California on 2/22/2016 . From Cyndi Taylor of Floyds Knobs, Indiana on 2/24/2015 .